You have a flat tire. You jack up the wheel, but it refuses to come off. Changing a tire should not be this hard. A tire gets stuck due to the accumulation of rust. This corrosion appears in the area between the wheel and the hub. This makes it extremely hard to remove the tire because it feels like it is permanently glued to the hub. Using a hammer can destroy the bolt threads. 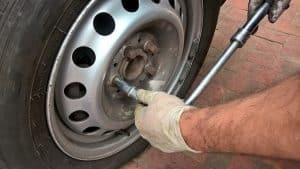 If you are changing the tire alone and there is no one to give you that necessary muscle, consider some of the following tire removal tips. Why does wheel get stuck on the car? If you leave in an area exposed to snow and road salt, then these elements can get into your aluminum alloy rims and into the hub where they cause corrosion. These corrosive elements tightly glue your wheel to the hub making it almost impossible to replace worn out tire. It is not only aluminum wheels that have this problem but also steel wheels. To prevent this problem from happening you will need to purchase some synthetic grease, which you can apply on the hub and wheel after cleaning it. You should do this the moment you purchase a new car. There those who opt to torch up the wheel so that it expands and dismounts from the hub. This method while effective can cause considerable damage to your wheels and is not recommended. The heat from the torch can also melt your tires causing further losses. If you have to use a lubricant go for the dry ones. These can be found in various hardware stores and online. Dry lubricants have fast evaporating carrier liquid; you can also use the lubricant on your vinyl windows. It is important that drivers avoid driving long distances with a flat tire. The friction produces heat, which causes the tire to be firmly fixed on the hub. Take your tires for regular wheel realignment – this will ensure that there is no wheel receiving more weight than others do. If you are near a service station or a garage you can use this simple trick to remove wheel stuck on the car. While the car is on the car lift/floor jack, put back the nuts but do not tighten them. Lower the car and drive a few feet forward and backward. Repeat this process on the level ground. Jack up the car and remove the nuts. The wheel should have loosened, and you should now be able to remove it. Ensure that when driving the car that the nuts are not too loose as to fall off. If you have aluminum alloys or steel wheels, then the likelihood of rust developing on the hub is high. You can use a rust removal lubricant to loosen the wheel. In the procedure first, remove the wheel cap and spray the wheel studs. You can use lubricants like PB Blazer or liquid wrench. After spraying the studs do the same in the area where the wheel intersects with the center hub. Give the spray ingredients around 15 minutes and then rotate the wheel until it loosens. After jacking off the tire remove the bolts except one. Use your foot to hit the tire while it is off the ground. Rotate the wheel and hit it again. 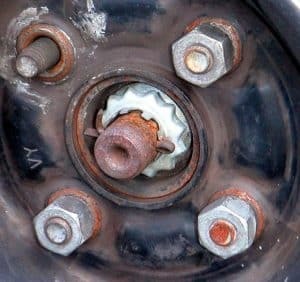 With continuous effort, the wheel should separate from the hub and you can then comfortably remove it after unscrewing the last bolt. This method of removing wheel stuck on the car is better than using a hammer to hit the stuck wheel. The force from a hammer will destroy wheel rim and bolts. Once you have removed your tire use some sandpaper to remove any rust on the hub. The next time you re-install the wheel applies some anti-seize. While this technique is not safe, you can try it out when you have run out of options with a wheel stuck on the car. The first part is to jack up the car and strategically placing jack stands near the tires. Before proceeding, ensure that the car is secure on the jack stands. Find lumber measuring 2X4 inches and place it in the space between wheel and tire. Identify a heavy duty hammer and then get under the car. Place the lumber across the wheel and tire and use your hammer to hit the lumber. This will free up the wheel and enable you to carefully remove it from the hub. You need to note that this method can be dangerous because you are under the car – should your jack stands fail the car will collapse on you, causing instant death. You also need to be beefy to operate the hammer. After you have tried all the mentioned techniques mentioned above and your wheel is still stuck you may be forced to take it to a tire service station. This is better than hitting the wheel with a hammer and destroying your bolts and hub. During service, the experts will perform some wheel rotation and alignment, and your car will soon be ready to go. Having a wheel stuck on the tire is not a pleasant affair – especially when you are in a hurry. The main cause of a stuck wheel on the tire is when corrosion forms in the area between the rim and hub. This corrosive element acts like strong glue and can cause problems removing the wheel from the hub. There have been various solutions proposed to remove the tire each with its set of pros and cons. The easiest of the techniques is to find a dry lubricant and spray it into the spaces in the wheel. This lubricant is effective to dissolve the rust formed. You can also jack up the car and leave one bolt still on the wheel. Use your leg to hit the wheel until it loosens. Some people use a heavy hammer or torch to dislodge stuck tire, but this can cause damage to the rims. It also requires you to pull up some muscle. If you have any questions, leave a comment down below and I will answer as soon as possible!